Hectic weeknights call for recipes that are quick to prepare. 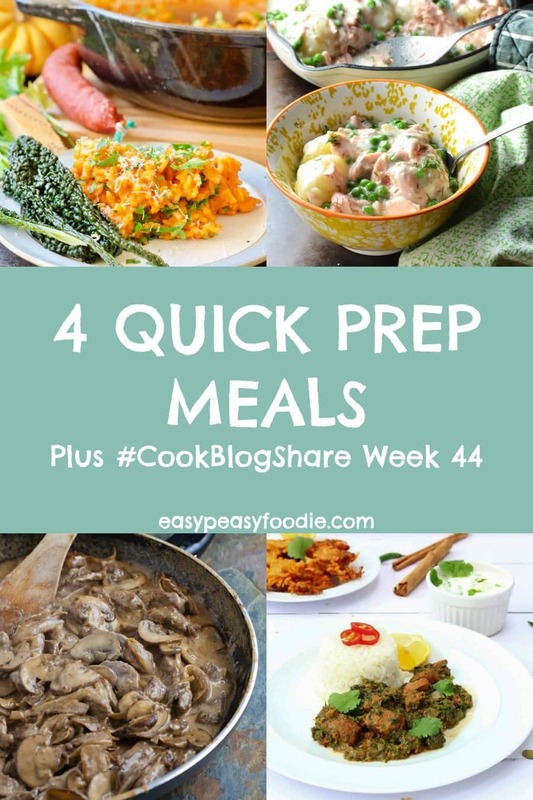 Here are 4 Quick Prep Meals – each takes less than 12 minutes prep time – plus the linky for #CookBlogShare Week 44. Are we allowed to mention the C word yet? I kind of feel like it is my public duty to announce that there are just 8 weeks to Christmas!!! Have you started preparing for it yet??? In my real life I haven’t even BEGUN to think about Christmas! But here on Easy Peasy Foodie, Christmas prep is in full swing. Last Saturday I cooked and photographed an entire roast turkey dinner (recipes on the blog soon). I’m also working on re-photographing my old Christmas recipes from back in 2015, when I’d only been blogging for 6 months and I still took really dreadful photographs. I feel sad because there are some awesome recipes there, but they don’t get much attention as the photos make them look so awful! I’m hoping with new photographs they’ll be much more popular. I’ve been sharing posts on how to protect your blog from hackers, how to improve your site speed and how to treat your blog as your business (and make decent money from it!). I’ve also shared my Beginner’s Guide to Mailchimp and a fab guest post from Emma Amoscato (from Free From Farmhouse) all about how to go from blog to book deal! Emma’s book Living with Allergies is out next spring! With all that going on with my blogs, not to mention my daughter’s 10th birthday in November and normal life on top, I’m crazy busy at the mo… Which is why these 4 Quick Prep Meals caught my eye from last week’s linky. 4 delicious meals, perfect for busy weeknights – and all under 12 minutes prep! 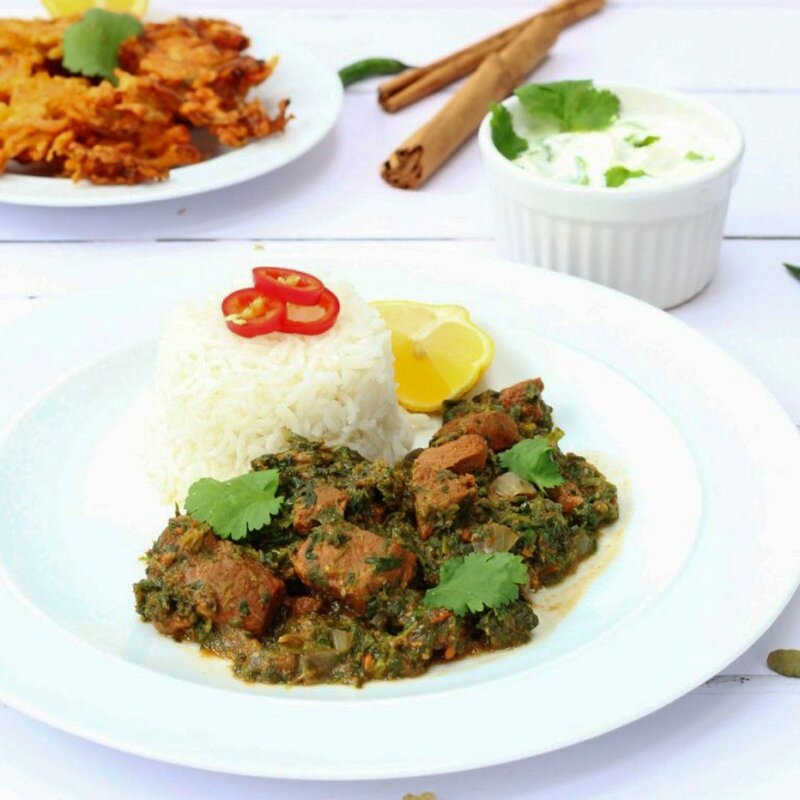 First up is this delicious Lamb and Spinach Curry from Corina over at Searching for Spice. This recipe (like most of Corina’s!) is right up my street. Just 10 minutes of prep, then this delicious looking Lamb Saag is simmered on the stove for 3 hours, making the whole house smell amazing in the process. This would be a great one to come back to after a busy evening of ferrying the kids about to their various clubs and activities… And I reckon this would also work brilliantly in the slow cooker too or in my new pressure cooker! Jacqui and I were clearly on the same page last week as we both shared beef stroganoff recipes! 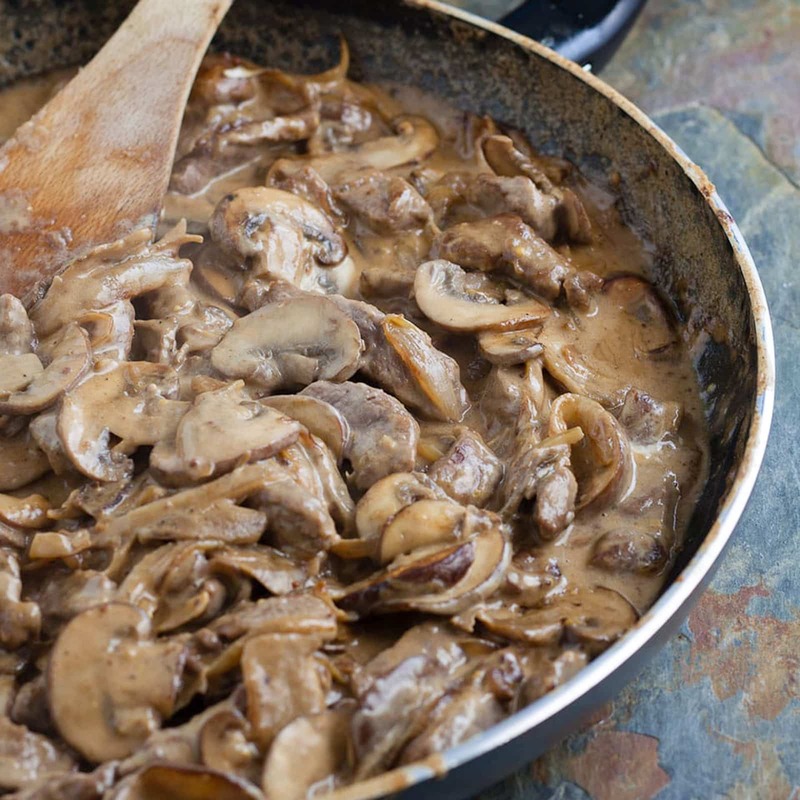 Whilst mine was designed as a way of using up leftover roast beef (you can find my Leftover Roast Beef Stroganoff here), Jacqui from Recipes Made Easy has created this gorgeous Easy Beef Stroganoff using thin strips of steak, together with a mix of porcini and chestnut mushrooms – which just sounds incredible! Better still the whole recipe is done and dusted in just 35 minutes. And, by using half fat crème fraiche and lean steak, Jacqui has kept the calories down too – just 414 calories a portion! 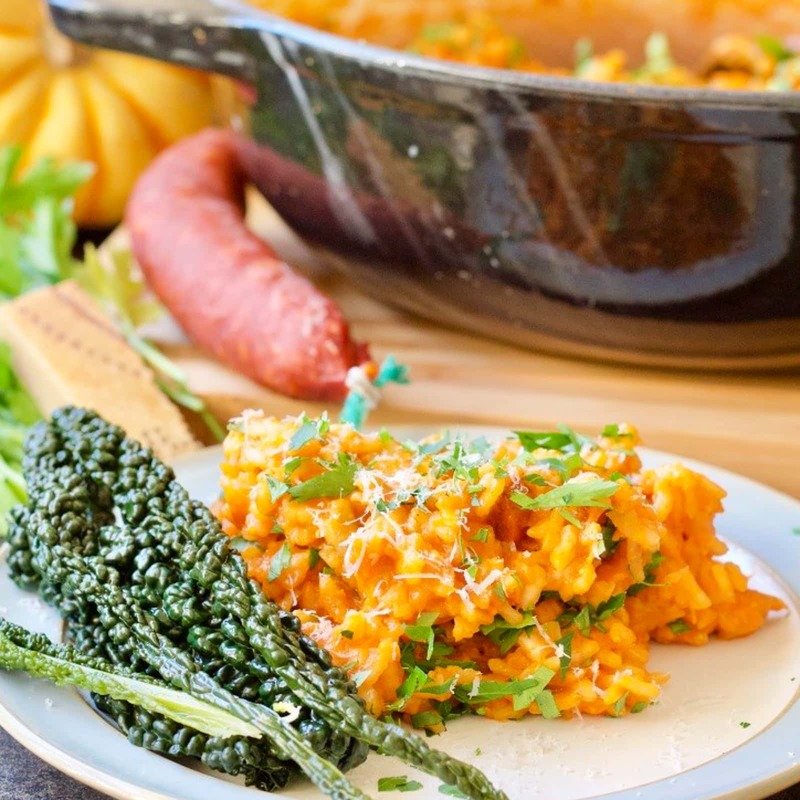 Jo from Jo’s Kitchen Larder has used two of my favourite ingredients – butternut squash and chorizo – to create this deliciously quick and easy Butternut Squash and Chorizo Risotto. Again, this recipe takes just 10 minutes to prep and only 40 minutes in total. It sounds so warming and comforting too – such a prefect meal for chilly autumn evenings! As you probably know by now I am a HUGE fan of leftovers meals – such a great way to speed up weeknight cooking! 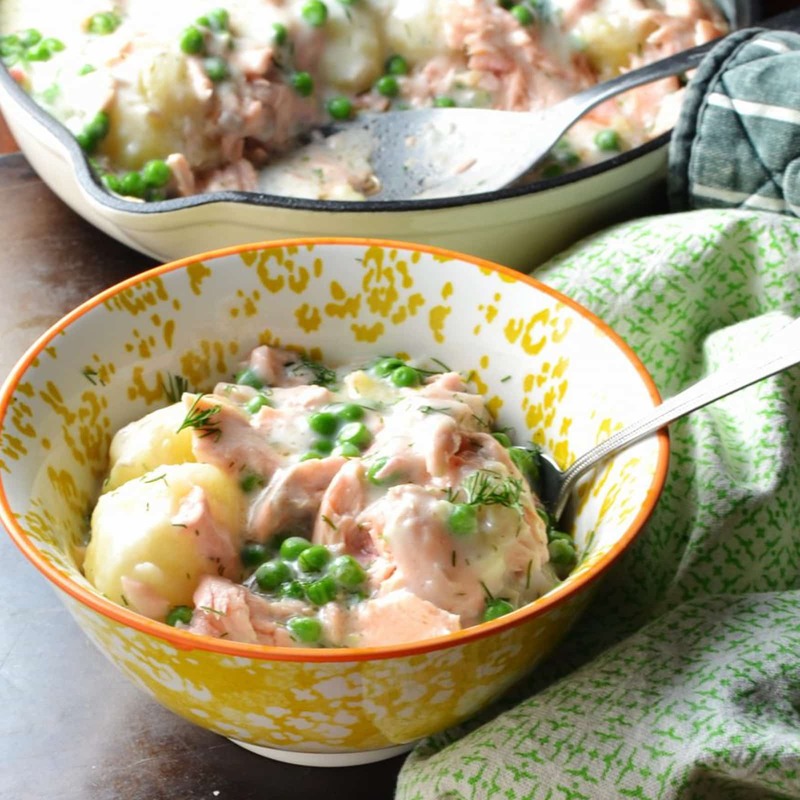 So this Healthy Leftover Salmon and Potato Casserole really caught my eye. Monika layers cooked potatoes, leftover salmon, peas and a white sauce in a casserole, before popping it in the oven to cook for 15 minutes. This recipe takes just 12 minutes to prep – meaning the whole thing can be made in under 30 minutes – perfect for busy weeknights!! Hello, Eb! Thank you for this week’s party! I hope you are having a wonderful week! Well we’ll believe that when we see it! Thank you for including my dish in this lovely roundup! I’ve been craving comfort dishes recently, so all these recipes look extremely appealing. Shared! All kidding aside, I am SO with you about re-shooting old photos. The most frustrating thing to me is re-shooting something expensive like Prime Rib Roast—and it’s STILL not good! Gah! Great roundup: these all look incredibly delicious, and meal-prep is my JAM these days. Just come back to link up a Sneaky Veg recipe this time! Easy recipes – yes, please. They all look delicious. I think I’m in denial Christmas is just round the corner – I have SO much to do and very little time to do it! I also have a load of very cringy Christmas posts to reshoot – the recipes are fab but the pictures are horrendous! That roast turkey shot looks amazing! Great round up. I love allll the recipes this week. Am off to pin them all!